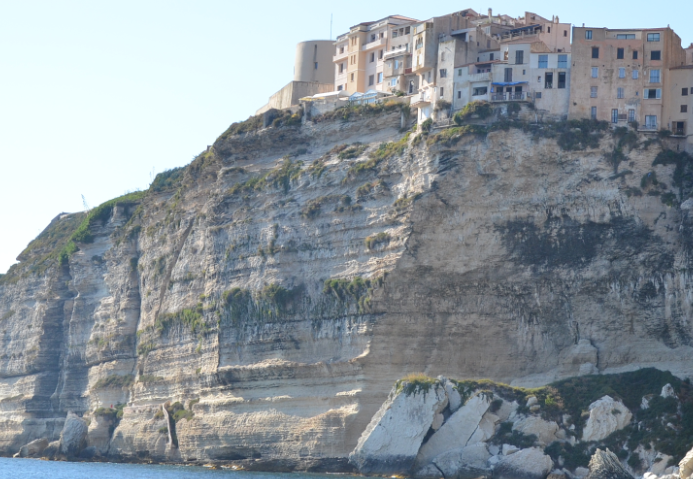 Building things can be done in two paradigmatic ways: with re-use and without. With no re-use, every time you build a new thing, you have to engineer all of its parts de novo. The result is (hopefully) exactly what you want, but the costs can be great. 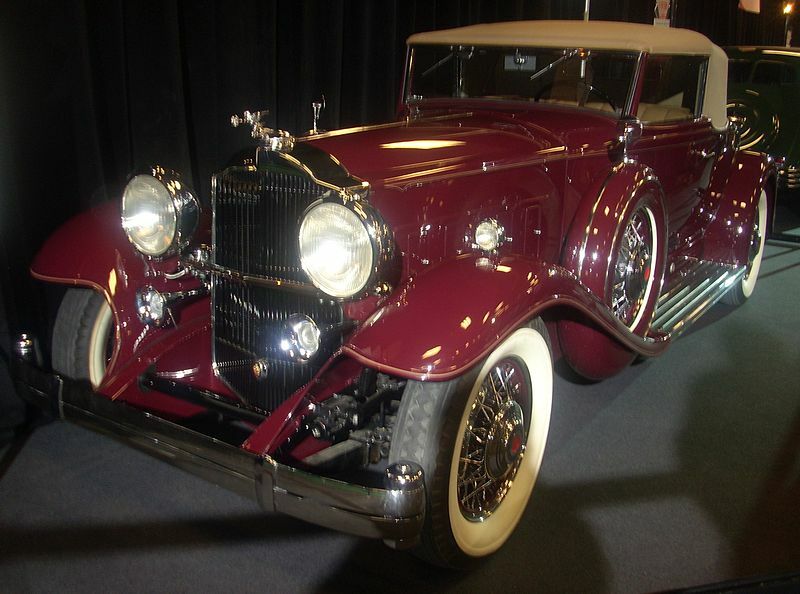 The earliest cars were all custom built models, with each model being its own thing. If you have ever admired a 1928 Packard ‘gangster’ saloon or an early Deusenberg or Mercedes Benz, this seems no bad thing. Even when Ford invented the production line, the cars were still largely custom across models – he had just worked out how to mass-produce each model. So what did they develop? A platform in auto manufacturing is a set of standard components that forms a core part of many specific models of a car. The chassis, drive-train, and motor are usually key parts of the ‘platform’. This platform can be reused to create multiple different models. Each of those models has other components that can assume the shape and functionality of the ‘platform’ components. This means that the platform components have a ‘specified interface’ that can be assumed across the company. For all cars built on this platform, the model-specific components can be built assuming this interface, which means they can be built in parallel, and by another part of the company, or even by another company altogether. 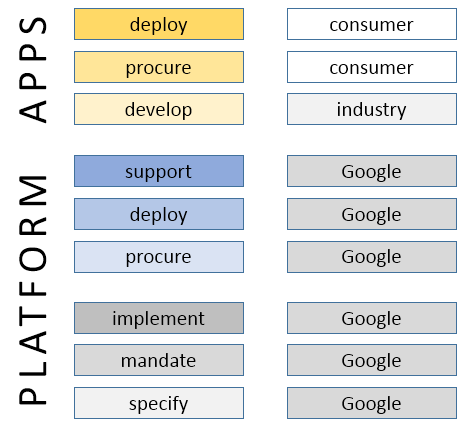 How do platforms work in IT? Consider Amazon, Apple and Google. Apple and Google have developed various technical platforms, based around the mobile operating systems IOS (Apple) and Android (Google). 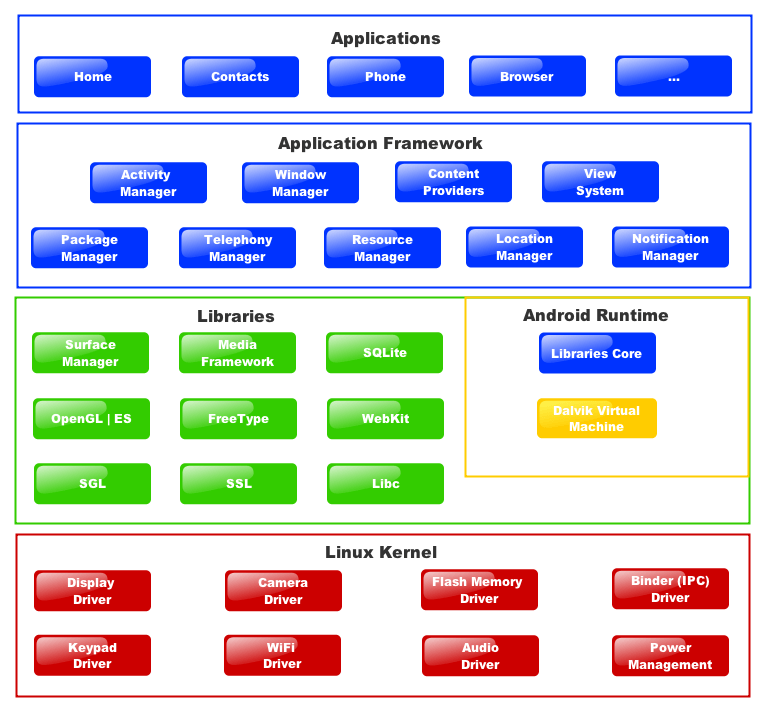 Some parts of the platforms are usable completely separately from mobile devices, e.g. Google Apps, Protocol Buffers etc. They use these platforms internally, in the same way as an auto manufacturer, but more importantly they publish them. 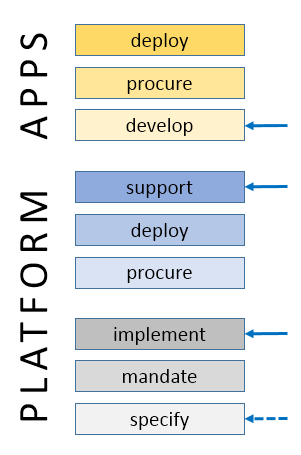 Via the published platform, 3rd party developers can build applications that use these platform definitions, and assume that those applications will in fact work on the deployed platform. Amazon, Apple and Google implement the platform themselves. What Amazon, Apple and Google are doing here is a kind of standards-based procurement, where they control and publish the standard, but leave it to 3rd parties to build the applications. We can picture this break-down with respect to Google. There are good reasons to do this. One reason is that no single company – not even a GE or an IBM – can do everything (although some well-know US vendors may not agree). Not only that, but many of the best innovations routinely come from small companies focussed on a specific problem, e.g. secondary analytics or computerised guidelines. With no reliable platform, those small companies typically implement poor quality data platform components that are not scalable or clinically safe, or else they sell their solution into a private ecosystem, e.g. Microsoft HealthVault, or else are simply bought by a much bigger vendor. A second reason why even big vendors are now interested in platforms is that in a world where the data are now recognised to hold the main business and consumer value, there is no escape from the need to work with data partners and to reduce obstacles to data coming into your computing environment. Two new consortia would seem to bear this out – the Healthcare Services Platform Consortium, set up by Harris, Intermountain and Cerner, and the CommonWell Alliance, set up by various large provider organisations. Onecomponent of the base standards referred to above is ontologies. 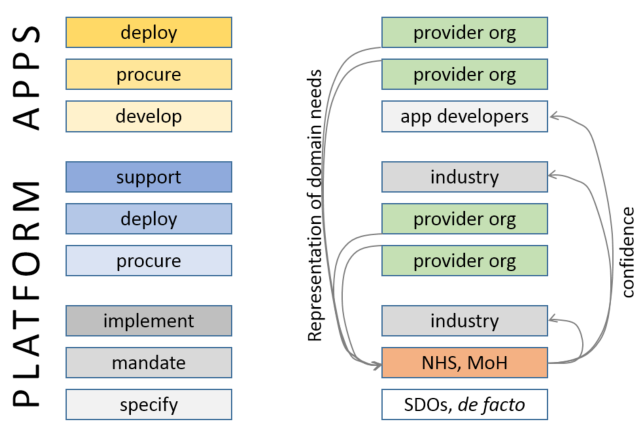 There are two common views about ontologies in the health IT sector: one is a view that ‘ontologies’ are an academic idea that might one day have some relevance in the distant future. The other is that we have already taken care of ontologies with SNOMED CT. Some readers might wonder why open source is not mentioned above. The main reason is that it is not part of the platform concept per se. Open source is primarily about models of collaboration and IP ownership. An open source community around a platform may increase the credibility of that platform, but it’s not needed for any technical purpose. Neither app developers nor back-end developers need to see each other’s source code for anything to work in a platform ecosystem. Whether, sociologically speaking more developers might be attracted to a platform if it has some open source components is another question. If this is true, then why the excitement about open source in places like the UK NHS? Well, one reason may be confusion to do with the difference between ‘open source’ and ‘open systems’ or ‘open platform’. However, there are at least two concrete reasons to see open source as useful in the platform economy: cost-sharing and agility. Open source can potentially reduce the amount of gross investment needed in some of the main components in the ecosystem, particularly in the back-end space. Consider the world today with Apache, and an alternative present with no Apache. In the latter case, it is very likely that there would be more commercial web server offerings from numerous companies, but not offering greatly different business value. Open source might make for fewer, better, or cheaper back-ends (it should be noted that big corporations fund most of the work on Apache, not private programmers). However, there is no guarantee of this. In the RDBMS market, the great majority of mission critical deployments are based on commercial offerings. Secondly, agility: open source creates a structure of IP ownership that cuts straight through what would otherwise be complex legal and commercial boundaries, and allows developers to ‘get on with it’ where in a purely commercial ecosystem, this might not happen. My view is that open source primarily matters around interoperability components – implementations of specific interface layers, whose sharing automatically pre-disposes the market to interoperability. However, I also think that whether high quality. secure back-end components are open source or not is irrelevant. What matters is their compliance and performance. Further, we need to remember that large parts of the IT layer in health are no longer software, but ontologies, terminologies, archetypes, computable guidelines and other ‘model artefacts’. These are by and large open source, already, or something close to it. There is another complex angle to do with open source that complicates the argument, and that is to do with original investment. Some open source is created from a very early point on as open source, and with investment on that basis. This kind of open source is uncontroversial. Other things that are open source today – e.g. the Eclipse tooling platform – were originally built as commercial products, and dropped as a ‘code bomb’ on the market. Very large companies such as IBM can afford to do this, as they have a global sales and marketing network that can exploit the new situation. However, small companies with significant IP but limited network cannot do the same, and can in fact be economically damaged by unilaterally open sourcing their wares. In this case, other bodies – perhaps government, or sponsor corporations – need to recognise the need and to help the original innovator recoup some of the costs, and have an economic future. What matters is open specifications that have industry credibility.